The Applegate Trail was the pioneers’ Southern Route into Oregon. In the 1840s it had its risks but with this new route there would be no drownings in the then dangerous rapids of the Columbia River. Southern Oregon has it all. From Crater Lake National Park, America’s deepest body of water to the world-renowned Oregon Shakespeare Festival in Ashland where you can watch the bard’s classics performed under a starry sky. Breathe the air in deep, look up at the evergreen forests, cast your line into a clear mountain stream. And enjoy a memorable meal at one of the region’s many outstanding award winning restaurants, wineries, and craft brew pubs. 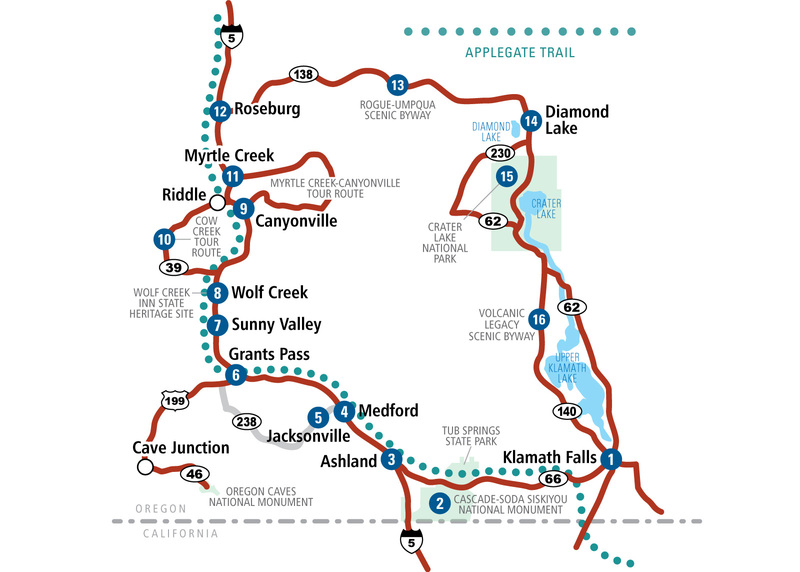 Your Southern Oregon adventure follows the historic route of The Applegate Trail. It begins at Klamath Falls and heads west to Ashland and then north through Medford, Grants Pass, Wolf Creek, Myrtle Creek, and Roseburg. The auto tour then travels east on one of Oregon’s most scenic drives on the Rogue-Umpqua National Scenic Byway featuring waterfalls, wildflowers and the North Umpqua Wild and Scenic River. Along the way you’ll see the Favell Museum in Klamath, and Ashland, known for its world-renowned Oregon Shakespeare Festival. Then it’s on to Medford and Jacksonville for outstanding restaurants, night spots and shops. 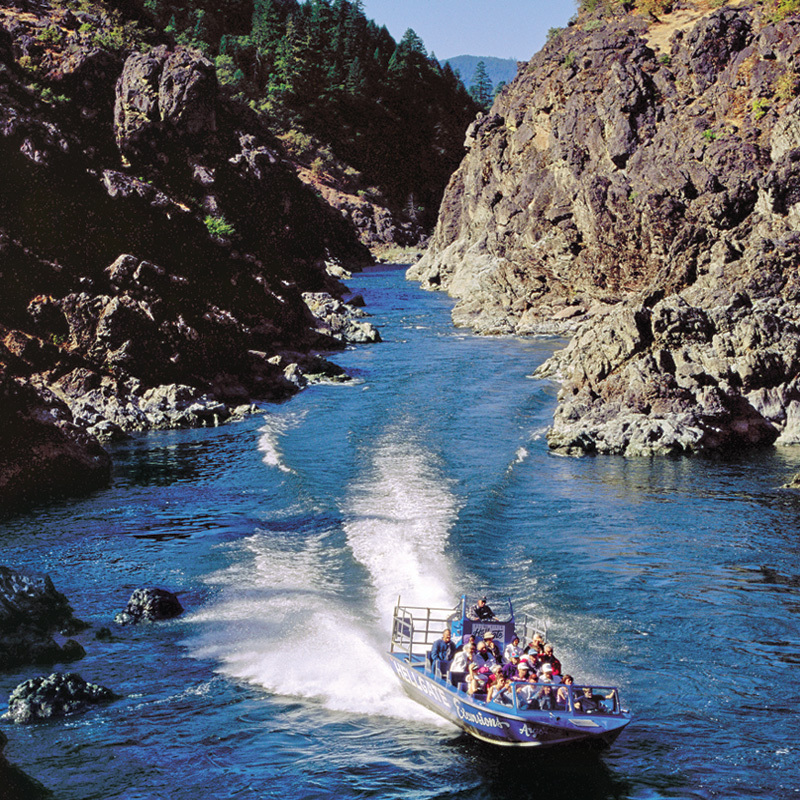 At Grants Pass you can tour the National Historic District and experience a jet boat ride through a 250-foot canyon. And at Roseburg you can enjoy an award winning winery or microbrewery. You’d better get going! Klamath Falls is the jumping off point for Crater Lake National Park and Upper Klamath Lake. Klamath Falls is home to the Favell Museumfeaturing an outstanding collection of more than 100,000 North American artifacts. Klamath Falls is also the focal point for the largest migratory bird route in the West. You can tour the 1905 Baldwin Hotel and the art deco Ross Ragland Theater, and sip a cool one at the Klamath Basin Brewing Company. Nearby, go kayaking on giant Upper Klamath Lake, go flyfishing on nearby clear water rivers and streams, and relax at a guest ranch or a picturesque cabin in the woods. For a memorable drive into Ashland. 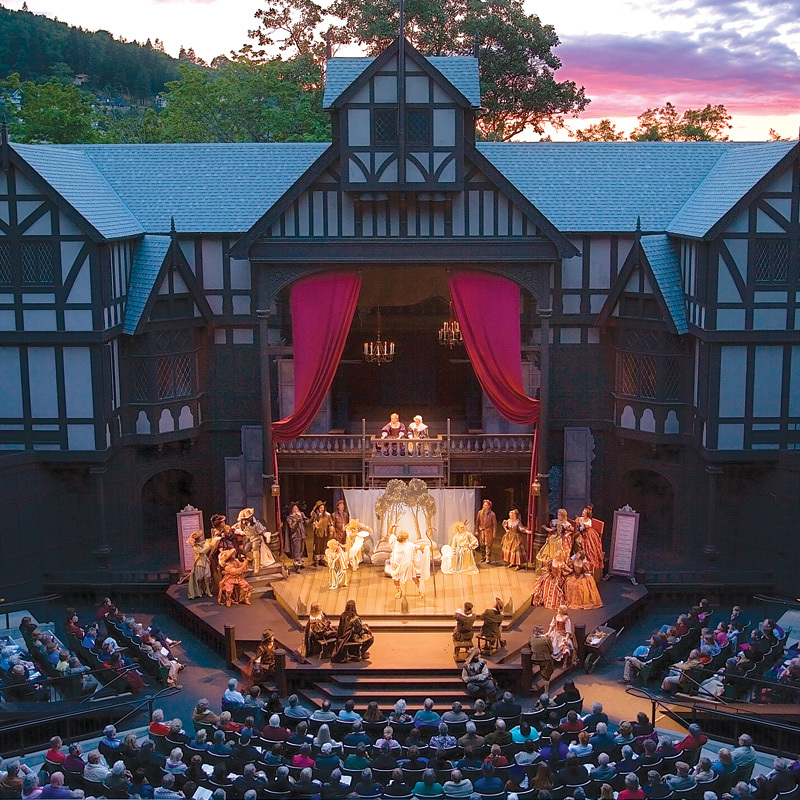 Ashland is home to the world-renowned Oregon Shakespeare Festival which features three different venues including the open-air Allen Elizabethan Theatre. Performances occur from mid-February to October. 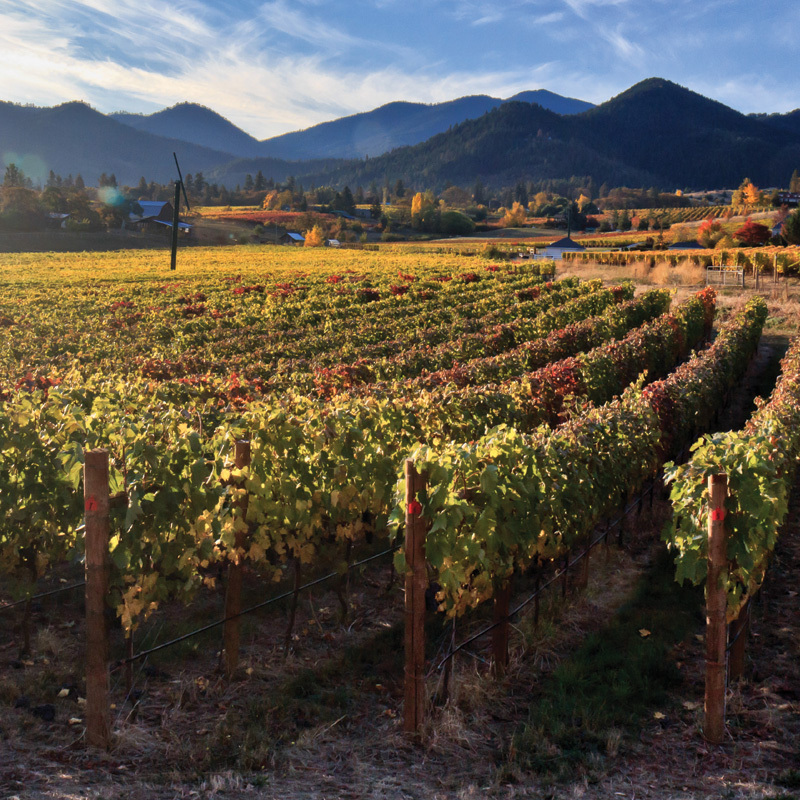 Ashland is also the gateway to six outstanding wine grape-growing areas and is home to the Applegate Valley Wine Trail which includes a number of excellent wineries. The Cascade – Siskiyou Scenic Bikeway also begins in Ashland and will take you to fir forests and spectacular views of Bear Creek Valley. Back on I-5 going north you’ll arrive at Medford where beautiful vineyards and fruit orchards surround the city. Here, you can take a factory tour of gourmet gift provider Harry & David, see the historic downtown filled with shops and eateries, and enjoy the classic Craterian Theater at Collier Center for the Performing Arts and the Britt Music & Arts Festival with performances from June to September. Just 5 miles west of Medford on OR 238 is Jacksonville, a quaint and historic community in the heart of Oregon’s gold rush country. The Jacksonville Historic District is designated as a U.S. National Historic Landmark and is home to boutique shops and fine dining. You’ll also find six tasting rooms and wineries nearby as well as a number of hiking trails to enjoy. 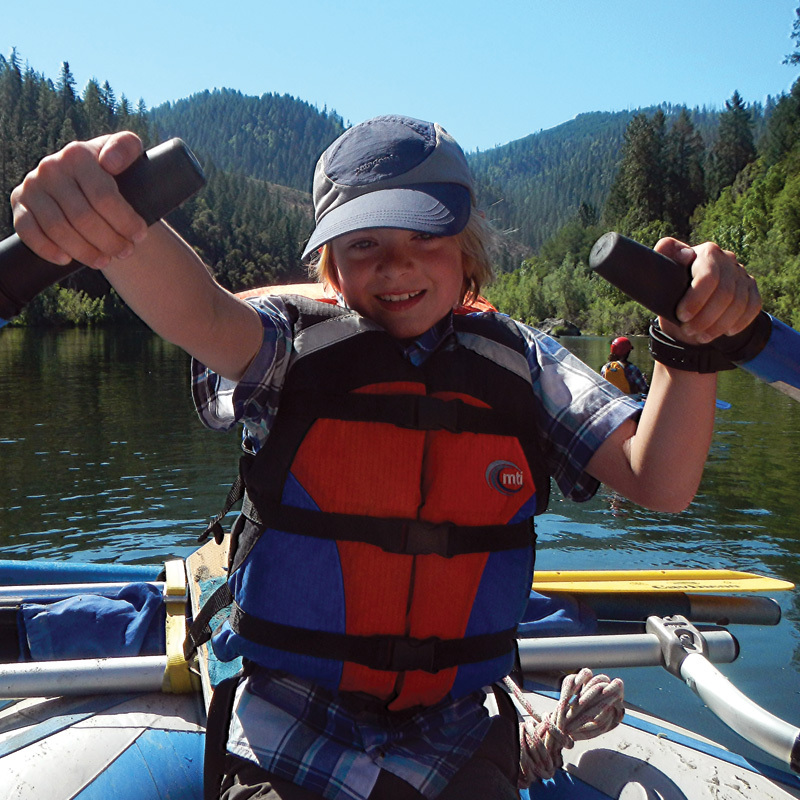 At Grants Pass you can tour its renowned National Historic District and take an exciting jet boat excursion through a 250-foot deep canyon on the iconic Rogue River, designated as a National Wild and Scenic River. You can also tour several wineries as you drive south from Grants Pass on US 199 to Cave Junction and the Oregon Caves National Monument for an outstanding cave experience, and Great Cats World Park where you’ll see leopards and Siberian tigers. Where you can see the intriguing Applegate Trail Interpretive Center featuring historical displays and an authentic covered wagon that will help you understand The Applegate Trail and its important legacy. Dine and spend the night at the historic inn, once a popular Stagecoach stopover on the historic Applegate Trail. Take a step back into time in this historic 1883 inn which is on the National Register of Historic Places and has been refurbished to suit the tastes of 21st century travelers. Enjoy a variety of diversions from gaming to spa services at the Seven Feathers Casino Resort. And 21 miles south of Roseburg at exit 103 is the Riddle Bypass Road which will take you west on OR 39 to Riddle. 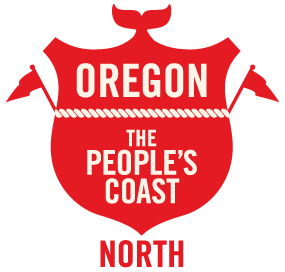 Which parallels Cow Creek and was once the route of the Oregon and California Railroad and a major gold mining area. Be sure to try your hand at the Recreational Gold Panning Area. Where you can take a break from Interstate driving and enjoy the Myrtle Creek–Canyonville Tour Route, a scenic route featuring clear-running streams, covered bridges, small towns, farms, and forests. Home of the Umpqua Valley AVA wine country. Take time to enjoy the town’s many galleries, shops, wineries and eateries. Discover the area’s history at the Douglas County Museum with artifacts from ancient spear points to thousands of historic photos, to quilts stored on covered wagons coming to Oregon. Known as the “Highway of Waterfalls” because of the number of cascades it passes by. You can stop at the classic Steamboat Inn for great fly-fishing and farm-to-table meals. 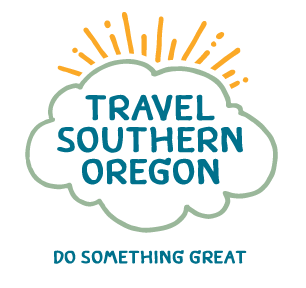 And along the way you’ll drive beside the North Umpqua River which is known for its sockeye salmon, steelhead, brook trout, smallmouth bass, and Class III and IV river rafting. At the base of Mt. Thielsen for a beautiful mountain retreat complete with trout fishing, biking and camping. Is south on OR 230 and OR 62 which takes you to the Southern Entrance, open year round. Crater Lake is considered one of the Seven Wonders of Oregon. This amazing lake resulted from the collapse of ancient Mt. Mazama. It is America’s deepest lake and features a stunning, neon blue color resulting from the lake’s nearly 2,000 foot depth. Take the 33-mile Rim Drive around the lake and marvel at the lake from several overlooks along the way. You can spend the night at Crater Lake Lodge and see a sunset you’ll never forget from its mellow terrace view. (OR 140) to Klamath Falls which is just 57 miles away. The entire length of the Volcanic Legacy Scenic Byway All American Road from Crater Lake National Park to Lake Almanor near Lassen Volcanic National Park in California is a 500-mile scenic journey showing how thousands of years of volcanic eruptions have resulted in some of the most dramatic sights you’ll ever see.